The Key Projects page provides you direct links to a variety of public departments throughout Santa Cruz County which are dedicated to economic development, projects and programs that help promote a vibrant community. As projects and programs move through the planning and entitlement process at the city, county and other public entities in the county, each agency will periodically update the status of the program and project. This page provides a convenient link for your easy access. The Economic Development Office is your go-to resource for all things business in Santa Cruz. Connect with us and we’ll connect you to the resources you need to get started or grow. At the Economic Development Office, their main job is to increase and support viable, sustainable, and innovative economic activities throughout the City of Santa Cruz, to expand our tax revenue, and to solidify Santa Cruz as an attractive, profitable, and healthy city to conduct business. Economic Development staff are committed to helping business owners achieve their goals for a successful business in the County. Many tools and resources have been made available to you on their website to provide assistance. Listed below are just a few examples of all the many projects going on around Santa Cruz County. To find a specific project not listed below, please click on the Economic Development title to be directed to their website. The Planning and Community Development Department is the one stop shop for all the commercial, residential and industrial projects through out the City. Your input is critical in making sure information here is helpful and relevant to your needs. The Planning and Community Development department process plans and provides status updates on the progress of projects for development projects to long term environmental, land use zoning changes that impact the city and our residents. A current list of major projects and the status of those projects can be researched here. 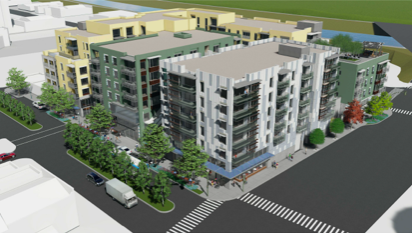 Project Description: This proposed project is for a four story mixed use development consisting of two levels of underground parking, approximately 14,000 square feet of ground level commercial, and 89 residential condominium units at 190 West Cliff Drive. ​This project still requires review by the Planning Commission, who will then provide a recommendation to the City Council. Project Description: Construction of a six-story, 315,698 square foot mixed-use building with 205 residential apartments and 10,656 square feet of ground floor commercial space on property located within the CBD/CZ-O/FP-O zone district and within the Pacific Avenue Retail District and Front Street/Riverfront Corridor subareas of the Downtown Plan. Planning Commission reviewed and recommended the project for approval to the City Council on November 15, 2018. Project Description: Construction of a 281,854 sq ft mixed used development with approximately 5,944 sq ft of commercial space and 33 Small Ownership Units (SOUs). 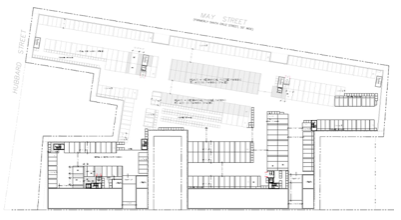 ​Project Description: Construction of a six-story, mixed-use building with 145 residential condos and 13,259 square feet of ground floor and levee front commercial space on property located within the CBD/CZ-O/FP-O zone district and within the Front Street/Riverfront subarea of the Downtown Plan. Requires approval of a Section 408 Permit from the US Army Corps of Engineers to allow for the placement of fill between the levee and the proposed building and to allow for the development of an outdoor extension area adjacent to the Riverway path. Requires review by the Historic Preservation Commission and the Planning Commission, who will provide recommendations to the City Council for final action.